Assuming the payroll stays at $96,726,166, here’s a look at possible solutions for the offseason. These 17 roster spots cost $77,850,334. Leaving $18,875,832 to spend on the following needs. If I’m Frank Wren, I look at LaRoche, Johnson, Branyan and Blalock. LaRoche wants a three year deal in the 25M – 27M range. I’d give it to him. Freeman’s struggles have shown that he shouldn’t be rushed to the show. I’d bring him up up in mid 2012. Nick “OBP Machine” Johnson would get a good fit for the Braves. However, he has a scary history of injuries and such. Russel Branyan would be a perfect power fit. He could probably hit clean up too. Bill James predicts he’ll hit 27 HRs, and unless Chipper REALLY breaks out of a slump, he’d lead the team in HRs. Hank Blalock is kind of a safety option for first, as is Dye. If I’m Frank Wren, and I have to pick one to acquire, I’ll go with Mike Cameron or Mark DeRosa. However, that may be too expensive, so I’ll pick, Cody Ross. Shifting Diaz to right, leaving McLouth at center and Ross at left could bring 50 to 60 HRs to the outfield. Ross could cost some good AAA players. I wouldn’t bring up with Jordon or Jason until mid-season. 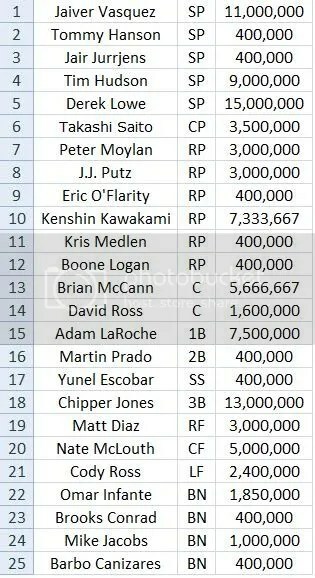 One of the 3 needed RP should be filled with in house options, so whose a better 12th pitcher? Logan or Acosta? Probably Logan… To save a draft pick I’d skip out on Wagner. 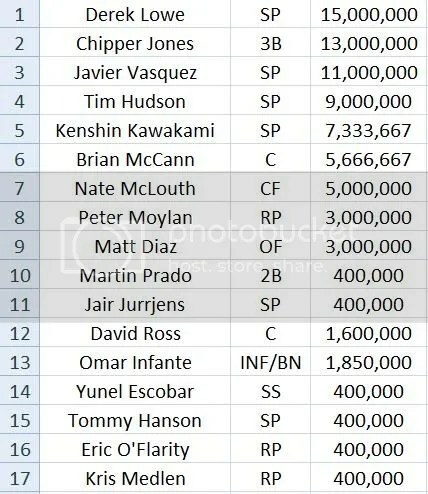 Instead, sign Saito (2yrs./9M) and Putz (1yr/2M base, up to 5M in incentives, with a 7M mutual option for 2011). If those fail, there are nearly a million options, like Abreu and Procter. For a final payroll of $96,450,334. GO BRAVES AND FRANK WREN!! !